Guess what I did yesterday!? I… spent about thirty minutes walking around the extended parking lot at the airport looking for my car. I rarely drive myself to the airport (huge baby), so when I did just that on Thursday morning (like um, MORNING-morning. like 4AM. ), I found a spot, pulled in, yanked my luggage behind me in a sleepy stupor and walked my way to the terminal. Then… somewhere over some plains or something – or whatever it is I have to fly over to get to the West coast – it dawned on me that the airport parking lot is like, sort of big. And it sort of all looks the same. Especially in the dark at 4AM. When you don’t drink coffee and also have on your glasses that make you look like an awkward 11-year old. Frantically, I texted my husband who told me that security could probably help me and to not worry about such silliness over the weekend. (Okay, whatever, I’m a complete nutjob and have anxiety about the jacket I will wear to the gym later and the lunch I want to make in four hours, but yeah… whatever.) So I didn’t, until I was up in the air yesterday with my ears popping ten million times over and with an idiotic scarf wrapped around my neck which was simply perfect for the 90 degree weather. I always fit in so well. Soooo yes… that was my afternoon delight. I didn’t ask security because I figured “Oh! I’m SURE I will find it easily!” and then proceeded to walk around the entire lot pressing the panic button on my key. Stubborn what? And I wish I could tell you that we ate something as delicious as these burgers last night when I got home, buuuut… we had Chinese take-out. It was just what I wanted, but not nearly as delicious as what you see here. Aside from surviving solely on blackberry grilled cheese’s last week, I also ate a good handful of these burgers since I was living the single lady life. It’s weighing heavily on me that this is my THIRD portobello burger recipe, because truly? It isn’t my all-time favorite way to eat them. But when paired with English muffins, they are like… my livelihood. The crust is what counts. The muffins are so crunchy and the crevices provide just enough bread, but not too much SOFT bread that can be totally weird with the portobello texture. And then there is asiago. And roasted reds. And glaze! There is just something about this combo that is truly outrageous, Jem-style. These are inspired by a dish at one of our favorite local restaurants and well… they were so delicious that it’s annoying me. Really. Add vinegar to a small saucepan and bring to a boil. Reduce to a very low simmer and cook for 10-15 minutes, until liquid reduces by about half and is slightly syrupy. Remove from heat, pour vinegar in a bowl or glass to pour, and set aside to cool and thicken. In a small bowl mix together 2 tablespoons of olive oil, smoked paprika and onion powder. Heat a large skillet over medium heat. Drizzle portobellos with the remaining olive oil and add a bit to the skillet. Brush tops of mushrooms with olive oil/paprika mix and place mushrooms top-down to cook for about 5 minutes, until slightly juicy. Flip, add asiago slices to the top and cook for 5 minutes more, or until mushrooms are evenly cooked and juicy and cheese is melted. Toast english muffins, place mushrooms on top, cover with roasted red peppers and drizzle with the glaze. Eat! Be annoyed. Eat a burger. 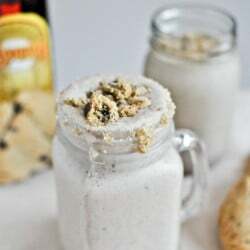 Chocolate Chip Cookie Kahlua Milkshakes. No Bake Peanut Butter S’mores Squares. Oh wow! I love portobellos and balsamic glaze! These look amazing and oh so juicy! Balsamic glaze makes everything 1000 times more amazing. I love this recipe idea and would have never thought to put them on an English muffin. I knew this would be good the moment I read the title, but the photos make me wish I had one now — for breakfast! 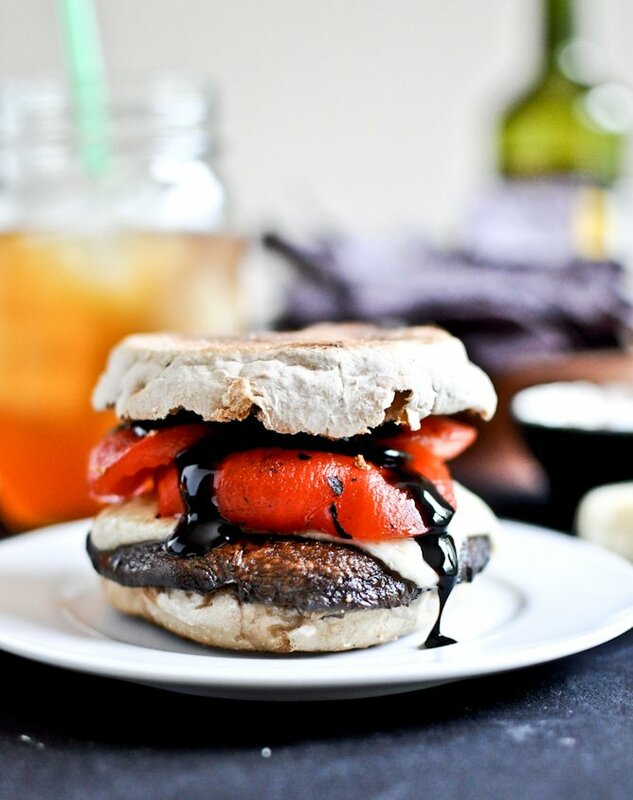 Our weather has turned hot and a portobello burger would be so could. I didn’t know you could cook them in a skillet (I’ve always broiled mine). made these last night for dinner – DEEEEEEE*LISH! and so frickin’ easy! even my roommate, who stated he does. not. like. mushrooms gobbled up two of them – I think this is an absolute keeper! Only you could make mushrooms look that good. Totally get how the crunchy~ness of the muffin would bring out the best in the mushy~ness of the mushroom! Totally missing you girls in Seattle! The city will never be the same without YOU! Looks yummy…can’t wait to try it out! Holy smokes! I’m a veg but still love reading your site bc my family is not. BUT! This looks good for the whole lot! SO fantastic. Good food makes me happy and I’m all about the happy, you know. Keep ’em coming!!! brioche bun, marinated portabella, truffle mayo, grilled sweet pepper, carmelized onions, and a thick slab of cream cheese……to die for! The last time I flew, the same thing happened. I got on the bus for the parking lot and the driver asked where I was parked and I couldn’t tell him. So we driving from one lot to the next with me pointing out possible hiding spots for the car. And eventually found it, 30 minutes later. Anyway, this burger does sound delicious and I love the use of the roasted red peppers with the balsamic glaze. It’s gorgeous. Tonight I made an “oldie” of yours: the beer/chicken slow cooked masterpiece. My husband, who claims to dislike chicken, assumed it was pork; he never even questioned me. It was wonderful! MY GOD! I’ve made these a couple weeks a go. So good! All the flavours come so well together! It’s amazing. You don’t even miss any meat, because of the portobello. I’m gonna make it again tonight :D Thanx for your awesome receipes! Hello..Tried these tonight..They were delicious..Forgot about the peppers, but they were still great. Just wondering if you know the approximate amount of calories? Thanks. Knocked these out a bit ago and absolutely loved them…like, want to marry them, loved them! I don’t think my wife would mind either because she would totally marry them too. Is there such a thing as food polygamy because I can totally get down with that! Anywho, thanks for the recipe and keep on keepin’ on. Cheers! I made them. Sooo good! I switched the cheese for hummus as I’m vegan ,I really loved how the flavours came together… and I usually hate mushrooms. i tried this recipe and LOVED it!!! Such a good one. I even posted it on my blog. Definitely referring this to others! I used sour dough english muffins instead and it was divine! I didn’t have asiago, but I did have fresh mozzarella, so I just gave it a try…licking my lips right now, so tasty! I made these awhile back, but finally getting to posting about it! Thanks for sharing-I LOVED this recipe!